Valerie A. 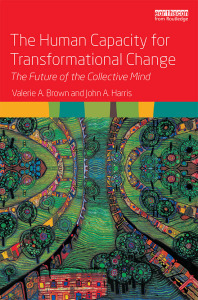 Brown and John A. Harris, The Human Capacity for Transformational Change: Harnessing the Collective Mind, Routledge/Earthscan, Abingdon, Oxon and New York, 2014. Valerie A. 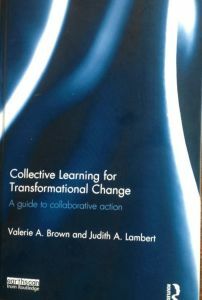 Brown and Judith A. Lambert, Collective Learning for Transformational Change: A Guide to Collaborative Action, Earthscan/Routledge, Abingdon, Oxon and New York, 2013. Valerie A. 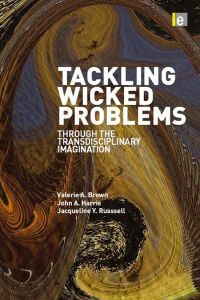 Brown, John A. Harris and Jacqueline Y. Russell, Tackling Wicked Problems: Through the Transdisciplinary Imagination, Earthscan, London and Washington DC, 2010. Dana M. Kelly, Valerie A. 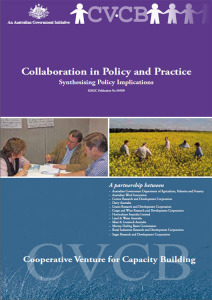 Brown, Michael Cuthill, Tony Byrne and Helen Ross, Collaboration in Policy and Practice: Report Synthesising Policy Implications Project Cooperative Venture for Capacity Building 2002–2007, RIRDC Publication No. 9/009, Canberra, 2010. Valerie A. 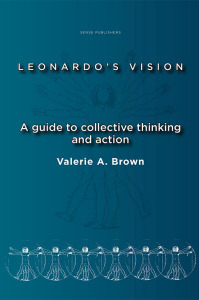 Brown, Leonardo’s Vision: A Guide to Collective Thinking and Action , Sense Publishers, Rotterdam, 2008. 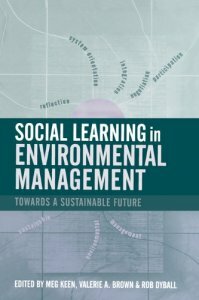 Meg Keen, Valerie A Brown and Rob Dyball, Social Learning in Environmental Management, Earthscan, Sterling, VA, 2005. Valerie A. Brown, John Grootjans, Jan Ritchie and Glenda Verrinder, Sustainability and Health: Supporting Global Ecological Integrity in Public Health, Allen & Unwin, Crows Nest, NSW, 2005. Heather J. Aslin and Valerie A. 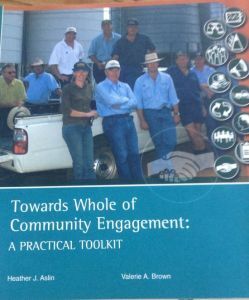 Brown, Towards Whole of Community Engagement: A Practical Toolkit, Murray-Darling Basin Commission, Canberra, ACT, 2004. Rosemary Nicholson, Peter Stephenson, Valerie A. 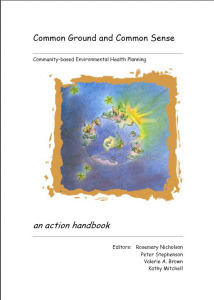 Brown and Kathy Mitchell (eds), Common Ground and Common Sense: Community-based Environment and Health Planning: an action handbook, Department of Health and Aged Care, Canberra, 2001. Valerie A. Brown (ed. ), Managing for Local Sustainability: Policy, Problem-solving Practice and Place, National Office of Local Government, Canberra, 1997. Valerie A. Brown (ed), Landcare Languages: Talking to Each Other About Living with the land, Department of Primary Industry and Energy, Canberra, 1996. Valerie A. Brown, Turning the Tide: Integrated Local Area Management for Australia’s Coastal Zone , Department of Environment, Sport and Territories, Canberra, 1995. Isaiah Berlin, The Crooked Timber of Humanity: Chapters in the History of Ideas , 2nd ed., Princeton University Press, Princeton, NJ, 2013. WorldWatch Institute, Vital Signs: 2007–2008: The Trends That Are Shaping Our Future, W.W. Norton & Company, New York and London, 2007. Lester R. Brown, Vital Signs 2005, Worldwatch Institute, Washington, 2005. Tony McMichael, Human Frontiers, Environments and Disease: Past Patterns, Uncertain Futures, Cambridge University Press, Cambridge, 2001. Helga Nowotny, Peter Scott and Michael T. Gibbons, Re-Thinking Science: Knowledge and the Public in an Age of Uncertainty, Polity, Cambridge, UK, 2001. James Lovelock, Homage to Gaia: The Life of an Independent Scientist, Diane Publishing Co., 2000. Thomas Berry, The Great Work: Our Way into the Future, Harmony/Bell Tower, New York, New York, 1999. Arnold & Amy Mindell, Riding the Horse Backwards: Process Work in Theory and Practice, Lao Tse Press, Portland, Oregon, 2001. Fritjof Capra, Uncommon Wisdom: Conversations with Remarkable People, Bantam, Toronto & New York, 1989. Norbert Wiener, The Human Use of Human Beings: Cybernetics and Society, Da Capo Press, Boston, Mass, 1988. Horst W.J. Rittel and Melvin M. Webber, ‘Dilemmas in a General Theory of Planning’, Policy Sciences, vol. 4, no. 2, June 1973, pp. 155–69. Charles Darwin, The Voyage of the Beagle, Borgo Press, Maryland, Virginia, 2008 (facsimile reprint of the 1909 Collier edition).